The first day of the year was celebrated by a traditional brunch. 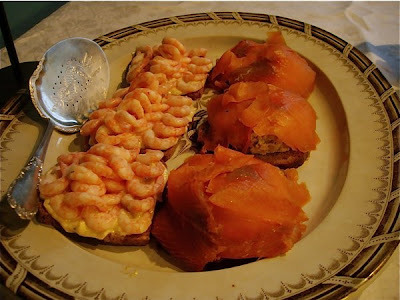 What is more traditional to serve in Norway than open sandwiches, seasonal Christmas beer, and shots of aquavit. The open sandwiches were inspired by the ones I have enjoyed in Denmark, with topping in abundance, but I made my little personal twist to them as well. I served Danish and Swedish aquavit. Here are the recipes of the sandwiches I made. 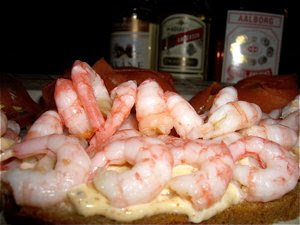 Open sandwiches with large prawns with mayonnaise are served all over Scandinavia. I used fish seasoning containing garlic, dried lemon, herbs and added Spanish paprika to create a spicy mayonnaise as an interesting contrast to the prawns. Truly a success, according to my guests. Mix mayonnaise with fish seasoning and paprika powder. I used Tone's Salmon and seafood seasoning, but if you do not have this mix, make your own. Then use a generous amount of garlic, pepper, lemon, dill, and paprika powder. 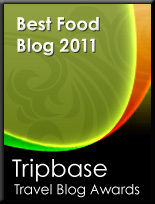 If you use dried spices and herbs, I recommend a pestle and mortar to grind the seasoning into a fine powder. This will draw more of the essences from the spices into the mayonnaise. Allow mayonnaise and herbs mix to infuse in the refrigerator for 2-3 hours. Peel the prawns, and clean them in cold water. (Do not throw the shells away. Boil in water with stock cubes for 20 minutes to make a stock great for soups and sauces). Spread equal amounts of mayonnaise on the rye bread and add prawns in abundance on each slice of rye bread. 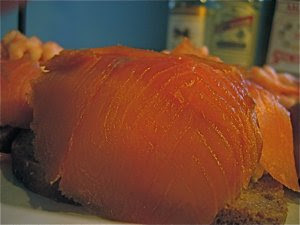 I used juniper smoked salmon from Lofoten producer. I mixed cold scrambled eggs with a sauce made from tarragon, mustard and mayonnaise. When assembled I poured a glass of Aalborg Jubileumsaquavit over the salmon, an idea derived from Ida Davidsen in Copenhagen. Mix Hellmanns mayonnaise with tarragon and mustard. Taste to find the right balance. Allow to infuse in refrigerator for 2-3 hours. Make scrambled eggs from eggs and water. Allow to cool down. Mix in tarragon and mustard mayonnaise. Build up scrambled egg on the middle of the slice of bread. Cover the scrambled eggs completely with the thin slices of salmon. Pour 2 cl of Aquavit over the salmon. A truly Danish specialty. I used Belgian pepper paté but most patés will do. Fry the slices of bacon on a low heat in a dry titanium pan with no fat until golden and crisp. Allow to cool down. Slice the mushrooms finely, and fry in excess fat in pan on a low heat. Add a little more butter if necessary. Add brandy and soy sauce to balance taste, and allow all liquid to evaporate, then add a little more butter and fry lightly. Allow to cool down in refrigerator. Then start to assemble the dish. 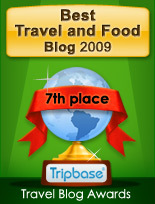 Place to slices of paté on the slice of bread. 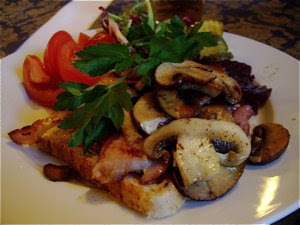 Add the cold crisp bacon, and mushrooms. Place in oven on a low heat (100C / 210F) for 10-15 minutes. Place cucumber on top when serving.